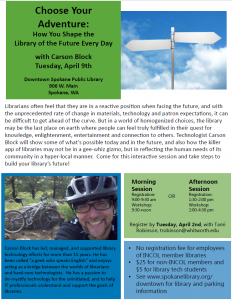 We are pleased to have Carson Block in Spokane on Tuesday, April 9, 2013. Choose the morning session or afternoon session. Feel free to let your colleagues know and post this flyer in your libraries! Librarians often feel that they are in a reactive position when facing the future, and with the unprecedented rate of change in materials, technology and patron expectations, it can be difficult to get ahead of the curve. But in a world of homogenized choices, the library may be the last place on earth where people can feel truly fulfilled in their quest for knowledge, enlightenment, entertainment and connection to others. 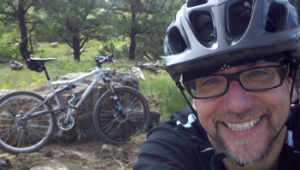 Technologist Carson Block will show some of what’s possible today and in the future, and also how the killer app of libraries may not be in a gee-whiz gizmo, but in reflecting the human needs of its community in a hyper-local manner. Come for this interactive session and take steps to build your library’s future! IT professionals understand and support the goals of libraries.